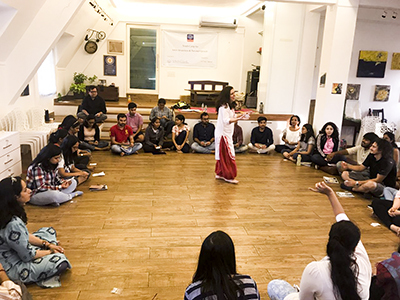 The second edition of Sri Aurobindo Society’s AuroYouth Camp was held on November 25, 2018, at The Studio, Fort in Mumbai, which saw the participation of around 32 people between the age group of 18 and 30 years. 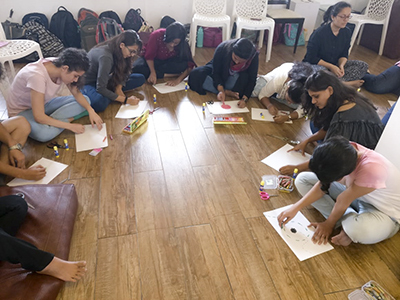 It was organized by the Mumbai branch of Sri Aurobindo Society and conducted by Ms. Anahita Sanjana and her team: Shailaja Munshi, Tanushka Vaid, Ashumi Mehta, Jasmine Sampat, Dolly Desai and Kadambari Shah. The session started by introducing The Mother and Sri Aurobindo, with a brief description of their goal and work. Then the 5 Koshas were explained – each with an accompanying activity for better understanding. With the Manomaya Kosha, there was an exercise of realizing the futility of our mental judgments about people. 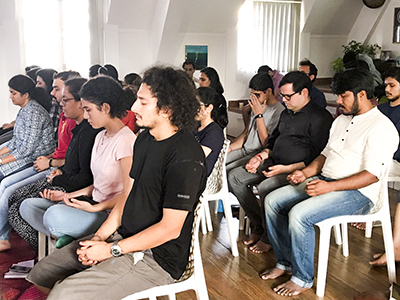 In the Pranamaya Kosha, an art activity was conducted on converting our inner weakness into strengths, which was followed by an exercise on gratitude. In the Anamaya Kosha, we spoke about the importance of good sleep, food and exercise. Then the Vigyanmaya Kosha and Anandamaya Koshas were discussed and an exercise of writing to our inner self was conducted. An exercise of breathing, meditation and using the techniques of Metta were then shown. Following this, the resource persons spoke on how to decide the Aim of Life, how to deal with various emotions and how to attain ‘Success in Work’ and ‘Success in Relationships’.